Hollywood loves coming back to this story; it shows the entire lifecycle of show business and celebrity in one easily-digestible morsel. Over the years, A Star Is Born has attracted the likes of Frederic March, Gloria Gaynor, Judy Garland, James Mason, Barbra Streisand, Kris Kristofferson, and now Bradley Cooper and Lady Gaga. It’s not hard to understand the affinity shown by filmmakers and viewers alike – at the core of A Star Is Born is a relatable melodrama of the sort that rarely gets made in an era when cynicism derides old-fashioned tearjerkers. This latest iteration of A Star Is Born keeps all the beats of the 1937 story intact (with the 1976 shift from acting to the music business) but resets the details to work for a modern audience. In his directorial debut, Cooper is respectful to the source material without being slavishly bound by it. His approach is perhaps the only way this third remake could emerge as its own entity. Although not entirely fresh, it doesn’t feel like a tired and unnecessary retread. For Warner Brothers, who funded this $30M production, there’s risk involved. Cooper, although recognizable in front of the camera for a variety of high-profile roles, has never helmed a movie of any significance. Lady Gaga, despite being a world-renowned recording artist, has never come close to headlining a major production in an acting capacity. Going forward with so much inexperience may have been a gamble, but it has paid off. Cooper directs with a sure hand, never overextending himself, and Lady Gaga proves to be a natural performer (she’s more believable in the role than Barbra Streisand was 42 years ago). She and Cooper exhibit a strong, primal chemistry. The movie works because we believe in them and have a rooting interest in their star-crossed, doomed love affair. If fame is parabolic in nature, then Country-Rock star Jackson Maine (Bradley Cooper) is on the downside of his geometric figure while Ally (Lady Gaga) is beginning her ascent. As Ally soars, rocketing into the stratosphere where Jackson once resided, he plunges into the depths. Her rise is fueled by his generosity and belief in her. When he meets her, she’s a “no one” singing “La Vie en Rose” in a drag bar. He gives her a place on the platform right at the moment when he’s falling off it, his addiction to drugs and alcohol combining with his failing hearing to consign him to music history. His relevance is gone. Soon, he will no longer even be able to sing in a Roy Orbison tribute. But he and Ally are in love. She tries to look past her gratitude and he tries to overcome the professional jealousy that has him reaching for the bottle. They marry but his bouts of sobriety are a prelude to bigger binges. Although every version of A Star Is Born has addressed the issue of alcoholism, none is more pointed in its depiction than this one. The movie is reminiscent of the 1994 Meg Ryan/Andy Garcia drama, When a Man Loves a Woman, in the way it successfully conflates romantic elements with the darker aspects of addiction. A Star Is Born doesn’t sugarcoat Jackson’s demons nor does it opt for an unrealistic or facile way out. This has been a consistent strength of every telling of the story but Cooper’s take is the most hard-hitting to-date. With his laconic style and 1000-watt smile, Cooper is ideal for Jackson. He also does an excellent vocal impersonation of co-star Sam Elliott (this is intentional and explained in the movie). However, as impressive as he is, Lady Gaga will get the attention. She’s very good (especially as the self-conscious and insecure pre-stardom Ally) and offers more depth and vulnerability than some viewers might have expected. Many singing stars attempt a crossover to acting; few leave this kind of impression. It’s fascinating to watch how the actress handles the character’s evolution from underpaid working girl to success, with a visual transformation (dyed hair, increasingly outrageous costumes) into someone who mirrors Lady Gaga’s own stage persona. Music is unquestionably a large part of the movie’s appeal. Although it doesn’t unfold in the traditional fashion of a musical with characters breaking into song in lieu of speaking dialogue, a portion of A Star Is Born’s screen time is devoted to performances. The numbers range from covers of familiar standards like “La Vie en Rose” and “Pretty Woman” to all-new country and rock songs. Regardless of how the movie does at the box office, there’s little doubt the soundtrack will sell. Well-made crowd-pleasing films always have a chance at attracting Oscar attention, especially when they feature unexpectedly strong performances from screen newcomers and focus on serious social issues. Additionally, Cooper is well-liked in the industry. 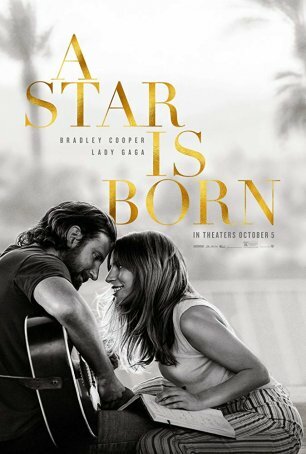 Using a term from yesteryear (which is, after all, where A Star Is Born has its roots), this is a “three-hankie movie.” Even the most hard-hearted and cynical viewer is likely to have an emotional reaction, and this is as much a testimony to the way Cooper tells the tale as to the story itself.